Liberal MLA Elizabeth Kikkert at the intersection of Tillyard and Ginninderra Drives. Photo: Supplied. 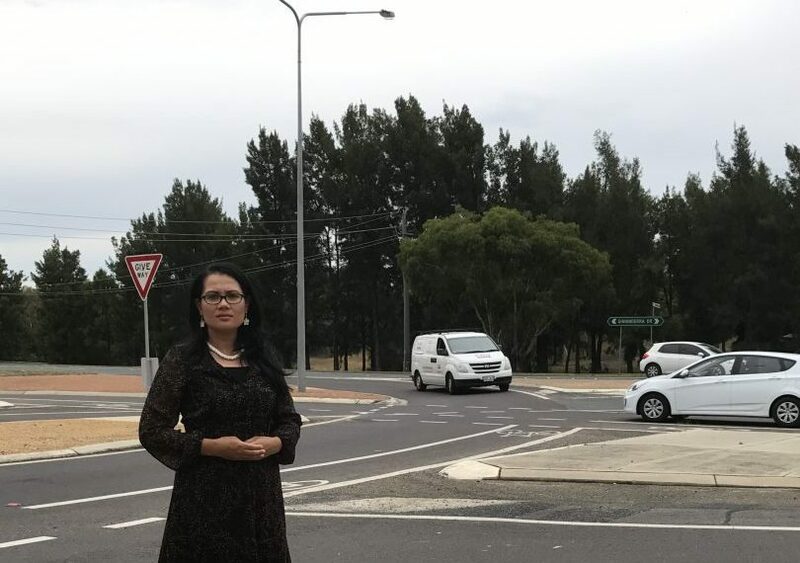 The long-awaited installation of traffic lights at two notorious intersections in Charnwood are about to become a reality after the awarding last week of a $2.7 million contract to do the work. The subject of a long campaign by residents, motorists and Liberal MLA Elizabeth Kikkert, the intersections at Ginninderra and Tillyard Drives and Lhotsky Street and Tillyard Drive will have traffic lights and other works constructed to prevent the crashes and threats to pedestrians that have marked those roads. The ACT Government said in a statement that Guidelines ACT Pty Ltd would begin construction in the next month. • Footpath connection from this intersection to the intersection of Tillyard Drive and Lhotsky Street. • Relocation of the existing bus stop north of the intersection about 20 metres further north. According to the contract, the work is to be completed by 31 July 2020. On her Facebook page, Ms Kikkert thanked the more than 1300 people who signed her petition in 2017, and everyone who supported her Assembly motion in 2018 to include the upgrade of the intersections in the ACT budget. The Government committed to the upgrades due to the high number of crashes, high volumes of traffic, long queues and delays. It said design work had also started for the intersection of Kuringa Drive and Owen Dixon Drive, including traffic lights and a shared path up to the Barton Highway intersection. Construction is expected to commence in the 2019-20 financial year. Christine Adams this is where you had your accident! You can “fix” this intersection all you want, but you can’t stop stupid... So many accidents that happen here are purely and simply due to people not giving way, or blindly following the cars turning in front of them, and not paying any attention to the oncoming traffic, or simply having the mentality of “I can nip through here and beat that oncoming car“. Lights are a fine idea, as they do stop traffic, but would not be needed here if people followed the road rules, and just gave way to oncoming traffic. Dollars to donuts this causes more accidents at the roundabout at the next intersection (just past the emergency services), as the same people who fail to give way at this intersection will now be failing to give way there, until these roadworks are finished, making that roundabout the next “black spot”. This is a bandaid solution to counter bad driving habits, which is not a solution to the underlying problem. Jeff Brewer you right all would be good if people just gave way and didn’t take risks. But the problem is the reason people take risks is the traffic volumes in this area mean a long wait for a safe gap in traffic. So lights are a means of regulating flow to provide those safe gaps. Chief Minister must be shareholder in company given contract at that ridiculous rate. Jeff Gadd so what should it cost then? Ashley Wright much less than that, closer to 1million, union cronies are probably getting the contract therefore ratepayers get screwed again. Wrong. The west setting sun blinds drivers who try, but fail to see smaller road users like bicycles and motorbikes. The number of accidents at that time of day is shocking. Elise Hnatiuk! How bout that! Rachel Fernance wow, about time! Daniel Oyston whats the going rate for a set of lights these days then? Traffic lights for West Belco and a tram for the inner city. Says it all really. And are you saying these lights are not justified? If so you are probably the only one, most will say very long overdue. Vanessa Jones what does it say exactly? Hooray! Just like most critical roadwork projects in the ACT, years too late and doing what should have been done before three ridiculous redesign attempts in preceding years. This should have been completely reworked when they built the new Charnwood emergency services building, but no let's muck around with cosmetic changes. Excellent initiative. I’ve noticed how much safer the road is after the lights and roundabout installations on Sternberg Cres behind the Erindale centre.